YouTube can be a great educational tool if you know what you’re looking for. It is well-known that bilingual children are at an advantage, like being able to learn new words easily, having better listening skills, using information in new ways. Even though nowadays schools generally teach a second language, encouraging your child from a young age to play and learn songs in Spanish, will definitely make a difference in their learning process. We’ve found some YouTube channels especially created for children that offer short, dynamic and varied videos for them to learn while having fun. Try them out with your children and let us know how they go! This channel is for toddlers and preschoolers. Through their animation videos they teach Spanish songs, crafts and other activities. The videos are colorful, energetic and definitely catch children’s attention. At times they speak a bit fast, they are clear and easy to follow thanks to clear images and sound effects. 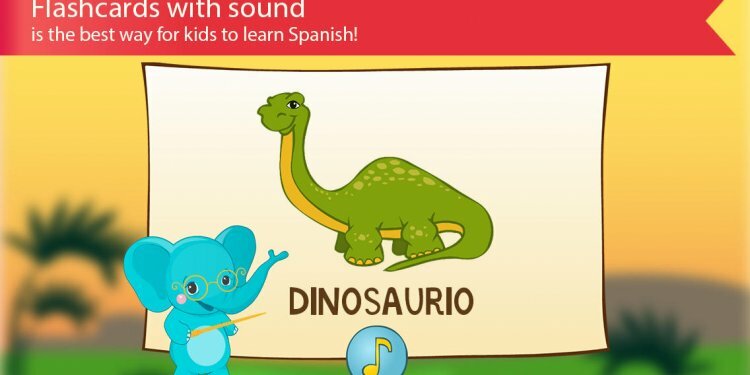 Spanish for Kids is a Spanish language learning set where cartoon dinosaur characters introduce the most common 200 words and phrases in Spanish. Children ages 2 to 7 will thoroughly enjoy this series that has won awards for its language teaching. This is very dynamic and complete! This Spanish channel has lots of songs for little children from 1 to 4 years old. Their objective is to entertain and teach values that are important to for children to learn. In addition to Spanish songs, you will also find classical music that helps children relax and sleep. It is a division of the Chilean TV Studio A Tiempo. They’ve become a huge succes, getting an average of 11 million views a month. This channel has plenty of cartoons and songs for children, and they also have storytelling, which helps your children develop their listening skills. Some of their most popular stories are “Josefina la Gallina”, “Pancho el Chancho” and “Dulcita la Vaca”. Here you will find different Spanish videos with performances and several songs with lyrics on the screen so that the children can sing along and practice their pronunciation. This channel was created in Colombia and they have been developing educational content for kids for the past 30 years. You can also find their content on Vimeo. This is a Mexican channel where you will find playlists for children of different ages. From creating monsters to listening to short stories, this channel is quite complete and varied; though not for true beginners since sometimes the language can be a bit difficult. Encourage your children to watch some of these videos and let us know how it goes! Follow us on Facebook and tell us which channels you think are the most entertaining and useful. If you have some other suggestions, please share them with us!